A 54 year-old provision shop turned cafe. Magical! Nostalgic surroundings with an old school playground across the cafe. Many retro trinkets inside the shop. In terms of decor this is my favorite cafe in Singapore. But no air con, and so many hipsters here, making me feel pretentious. When I was talking to the owner, a young customer interrupted our conversation. She was excited–I was excited too–but it was plain rude. Not a fault of the cafe of course. Quite a variety but you can easily buy ingredients from supermarket and cook at home. 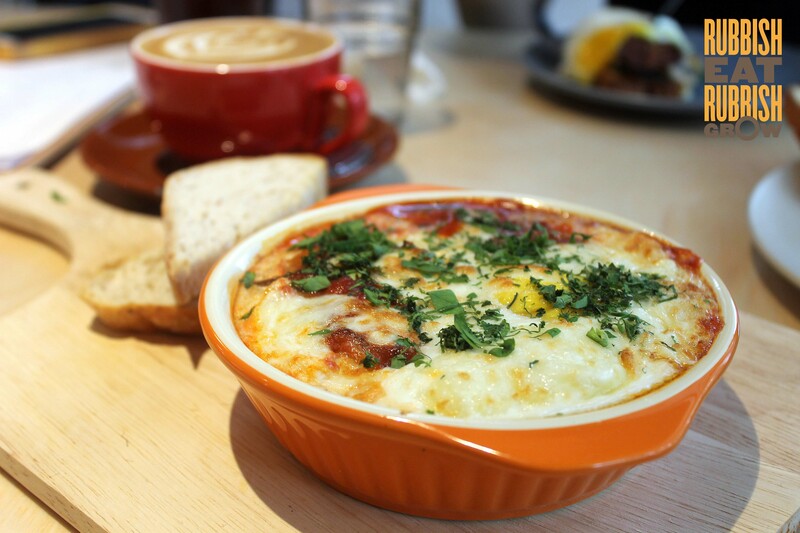 Shakshuka ($17.90, baked eggs in tomato, with sausage and potatoes) was too tart and sausage generic. 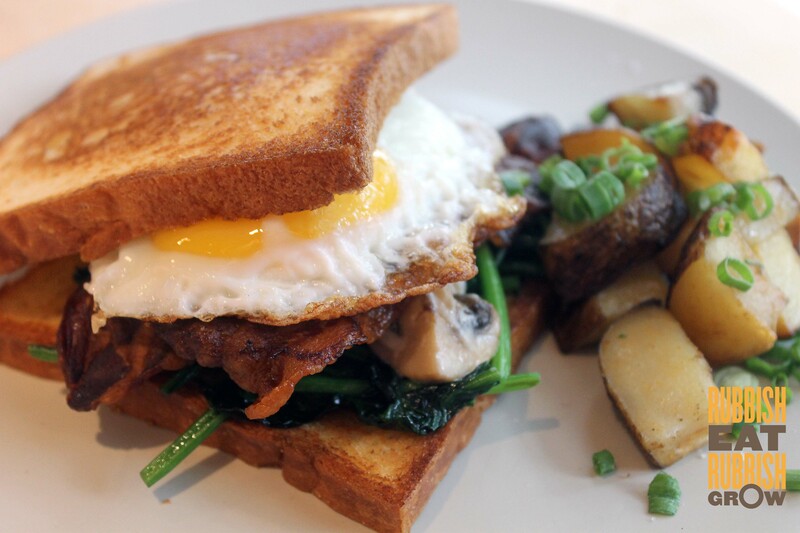 Umami brioche ($16.90) with sunny sideup, bacon, and spinach. Too much carbs. Bread was more French toast than brioche. Love the abundant spinach. 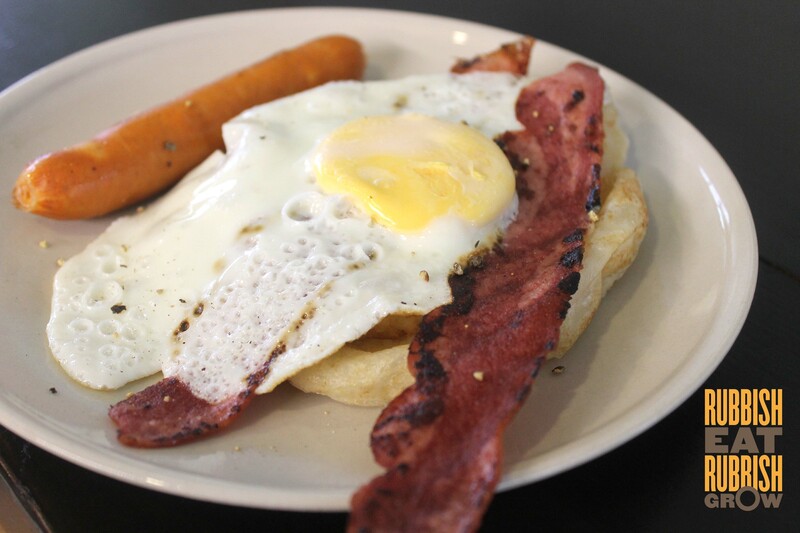 No variety, just a savory pie and all day breakfast ($12.90), consisting cheese hotdog by the side, a prata topped with cheese, hash brown, bacon and egg. Man, I know microwaved egg and bacon when I see them. Ingredients tasted as if bought at supermarket and assembled at cafe. I really abhor processed food; it poisons the body. 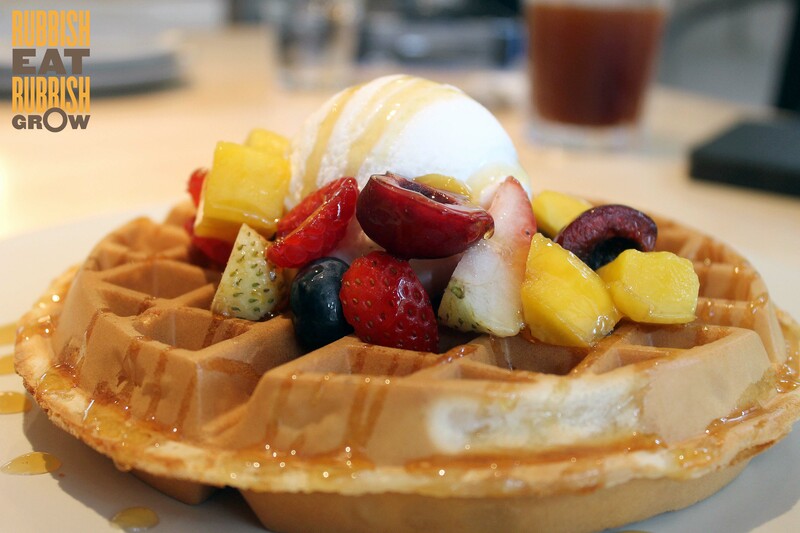 Waffles ($13.90) was one of the better ones in Singapore. A tad hard but tasted sweet like the thin, round, coloured wafer I ate at provision shop when I was young. Fresh berries to undercut the candy sweetness. So good Huccalyly wanted a second. The table next to us had fried chicken and waffle ($21.90) which looked and smelled stunning. Cakes and muffins, many of which are catered. Milo cheesecake ($6.50) was like eating a Milo drink gone sour (because of the cheese), which I liked but Huccalyly didn’t. 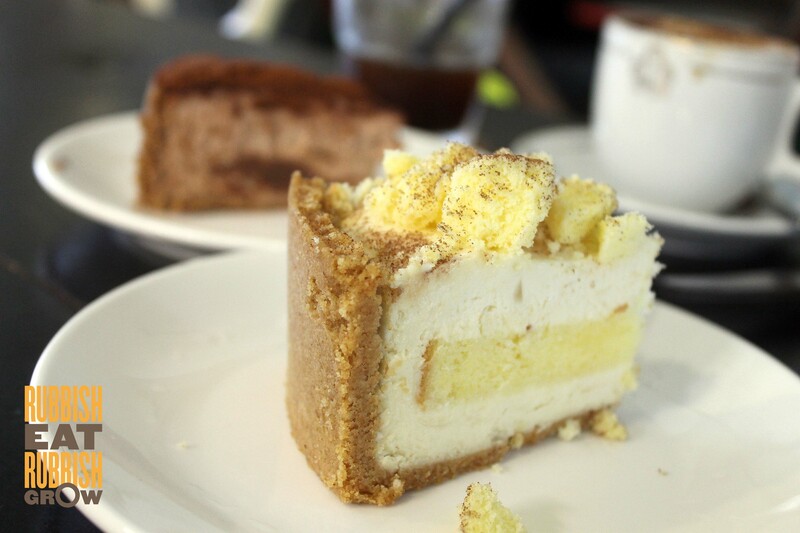 She liked Mao shan wang cake ($6.50) but nothing beats the Goodwood Park’s. I dislike cafes that cater food from elsewhere. I might as well review the caterers’ food, instead of the cafe. Deduct 0.5 for processed food and catered cakes. Papa Palheta beans. Huccalyly gave a face when she drank her iced long black ($6). My flat white ($5.50) was robust but monotonously bitter. Dutch Colony beans. Huccalyly’s iced long black ($5) was miniscule. My flat white ($5) very strong, but very bitter with a sour aftertaste, like kopitiam coffee. Service Pay at the counter and they deliver. Though minimal contact, wait staff asked us how food was, and even poured water for us. (Water is self service.) Felt like cafe was run by a group of friends. Sincere service. Minimal service like Sin Lee. The male boss was very nice, and friendly, but the other staff looked bored. -A missed opportunity to pay tribute to the historical location by having fun dishes like lor mee pasta or prawn noodle pasta. Price Paid $60 for 2. 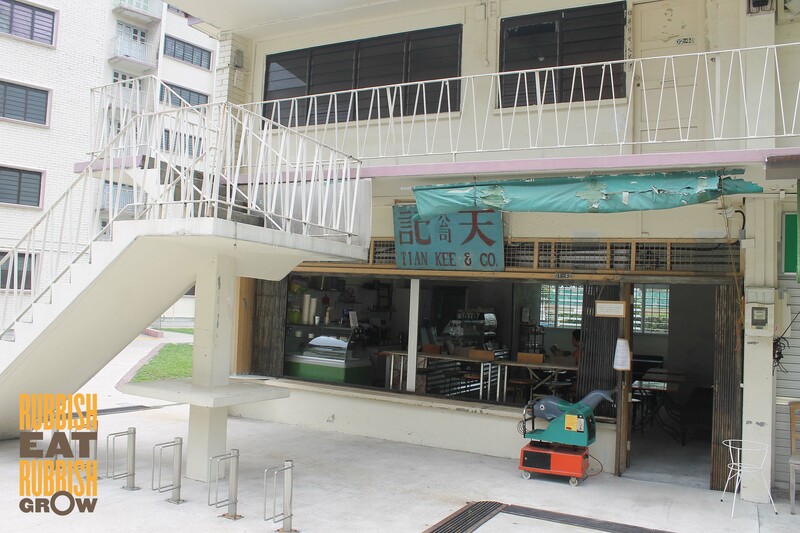 Pretty expensive for a void deck cafe. No GST no service charge. $36 for 2. No GST no service charge. I guess the concept of using nostalgic sites as cafes is getting a little way too common ever since Chye Seng Huat started, with The Dispensary, My Awesome Cafe and ROUSE using the same concept before these two. Wanted to like these two badly but one lacks character though has more than decent food, and the other has the atmosphere but lacked on the food. If only they could bring in some nostalgia with both ends it would have been a lot better … …. Have to give Sin Lee bonus points for their sincerity. I find the wait staff very very nice and they put in effort. Yeah Tian Kee is magical. The entire estate conspires to make the cafe work. What were you expecting? 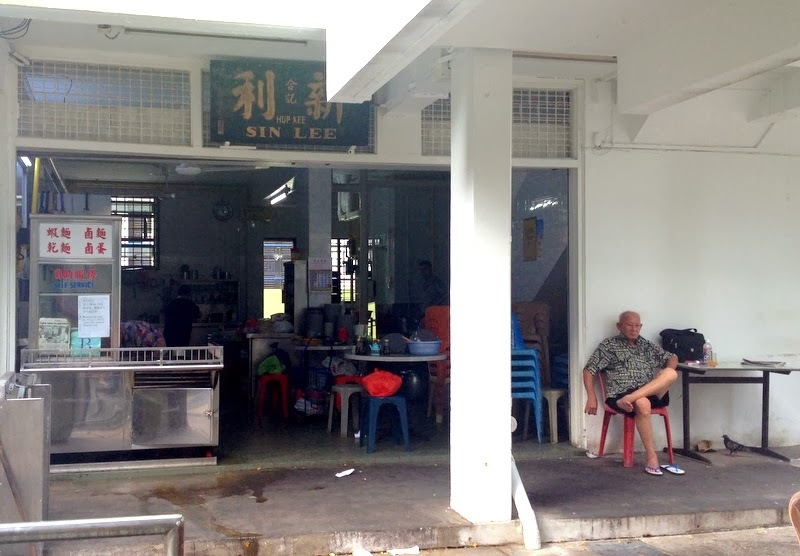 Tian Kee to rear their chicken for eggs and pigs for bacon? Obviously ingredients have to be bought elsewhere just like any other cafe. They make their own pies and some bakes like muffins. You seemed already biased before even going to Tian Kee. I don’t know anyone from either cafes, so no bias here. 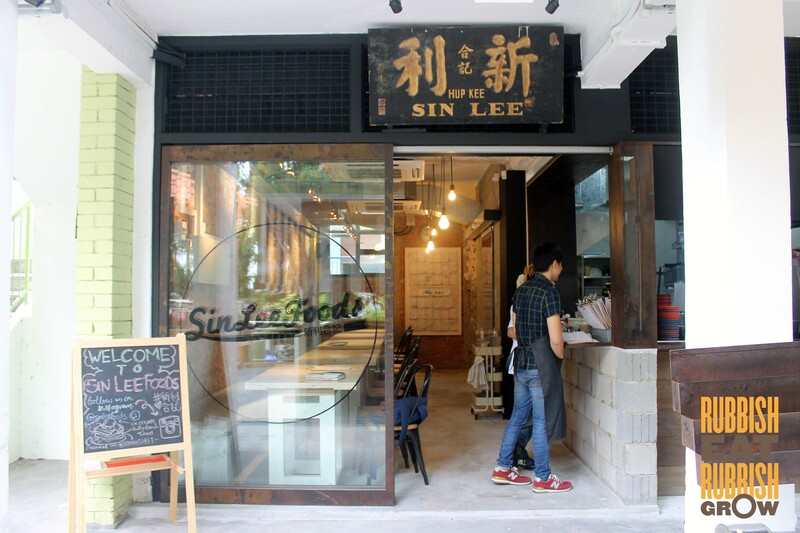 And if you read properly, you’ll see I gave a balanced view for both cafes, and I said the same thing for both tian kee and sin lee: they use processed food but sin Lee is more sincere in having a hot kitchen to cook and present the food. Is it clearer? In your post you’re implying that all cafes serving food shouldn’t buy ingredients elsewhere to assemble (cook) at their cafes or outsource their cakes or bakes at all. ALL cafes have to buy ingredients from elsewhere & most establishments like eg OMC outsource their bakes (pastries from BAO, cakes from Edit Patisserie.) What about MBWG? All their cakes are outsourced. Artistry, Maison Ikkoku, Dutch Colony etc too. Some cafes do not have the licence for a hot kitchen and have to resort to using microwave, including the Coffee Club at Paragon. It all depends on what the cafe is trying to offer their customers, in this case, nostalgia and a place to hang out and drink coffee. 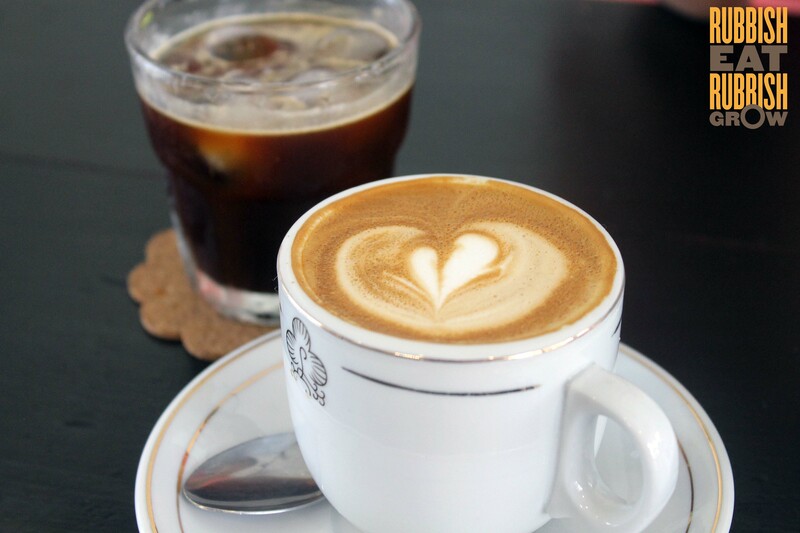 A cafe is a dream of a small-owner to present his or her vision of what homeliness is to customers. They shouldn’t serve food they wouldn’t serve to their families and friends. I’m not saying that they shouldn’t buy their ingredients. Of course they must! It’s common sense. But they shouldn’t serve those things that are found in supermarkets or taste like it’s found in supermarkets. Why should I go to a place to eat food I can make at home? Take a burger for example. The buns can be from suppliers, but not like those supermarket buns. I know many cafes with integrity that scout a long time for buns, and some cafes provide their own bun recipes to suppliers so suppliers only follow instructions. Beef, of course, is bought, but the patty should be made according to the cafe owner’s own recipe, and cooked on a skillet or grill, not a processsed patty in a microwave. You buy ingredients from elsewhere, but you must make the dish your own. Some catering is fine, but if most items are catered, then why open a cafe in the first place? It should just be called a outsourcing shop, or a retail shop. Selling nostalgia is a sorry excuse for a cafe. I don’t know what OMC and MBWG mean. Do you see me reviewing Coffee Club? But your argument is fallacious. Why mention the bad ones? 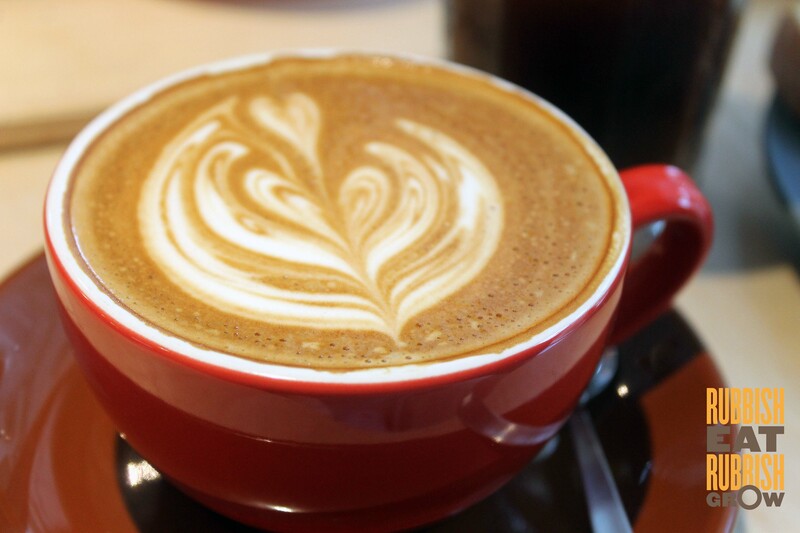 If you need a list of cafes with integrity, let me know. 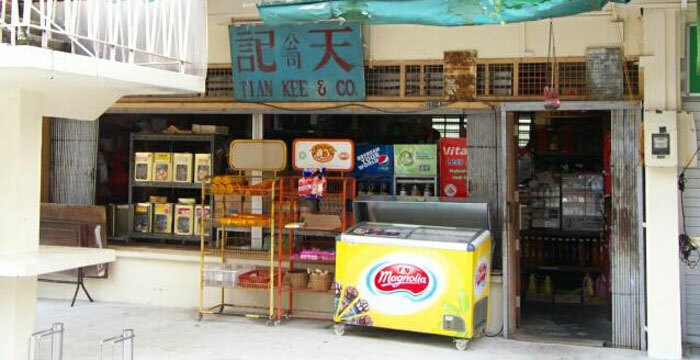 ps: are you the owner of Tian Kee or related to Tian Kee? I haven’t been to OMC or MBWG, but I think some outsourcing, and some catering is fine. It is impossible for a small cafe to do everything. But when you outsource a huge portion of food in the cafe, there is something wrong. That’s really too bad both had serious faults! The photos looks really yummy though! This is hilarious. I think I might just be the table next to you. I was there on Sunday, around 10ish? I certainly heard the uncle on the inside table , go “KNN” and aunties with curious stares outside the shop. 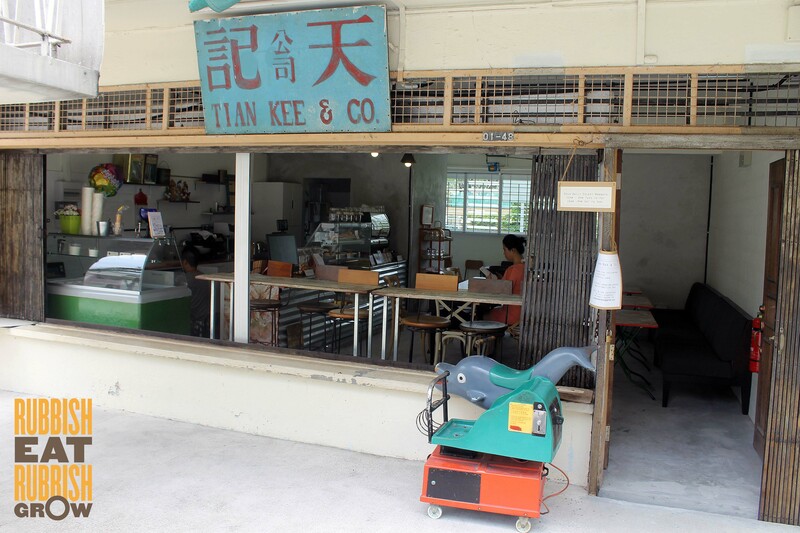 Thanks for your review on Tian Kee. I tend to avoid processed food too. But if it’s used in a dish, I feel that some effort has to be put into the dish, e.g. Shasuka from sin lee had sausages as well. I wouldn’t pay if it’s something that I can whip up at home. I was there on a Friday. It’s funny how many Hokkien uncles go to Sin Lee. I genuinely thought you were the table next to me. Who would’ve thought that there are so many hokkien uncles there. Or maybe it’s the same hokkien uncle and he is a regular there. Thanks for telling your experience. As you can see in the review, I agree with you.